Berkeley Hall attracts homeowners looking for resort-quality amenities of a top-flight private golf community in a place that feels like home. About 70 percent of its residents live there full-time so you’ll make friends and neighbors who will be around. And with demographics ranging from retirees to families with children it never feels like a retirement community. While some private communities tend to exhibit a “cookie cutter” look in terms of architectural styles, Berkeley Hall real estate offers a wider variety and encourages unique architectural elements so that each home has its own personality. There are 554 total home sites on Berkeley Hall’s 900 acres, making it a relatively low-density community. Most homes have golf, wooded, lagoon, or marsh views and there are deep-water lots as well. Estate Homes from 2,400 square feet to 12,000 square feet and larger. Styles vary from traditional Lowcountry to Caribbean to Mediterranean and French Country. Carolina Lifestyle Homes, which are single-family construction with a large screened outdoor room at the heart of the design. Lifestyle Cottages are zero lot line (patio) construction homes with all exterior maintenance and landscaping overseen by a Property Owners’ Association. Fully furnished Golf Cottages, which can be purchased or used to provide overnight accommodations for property owners or invited guests. 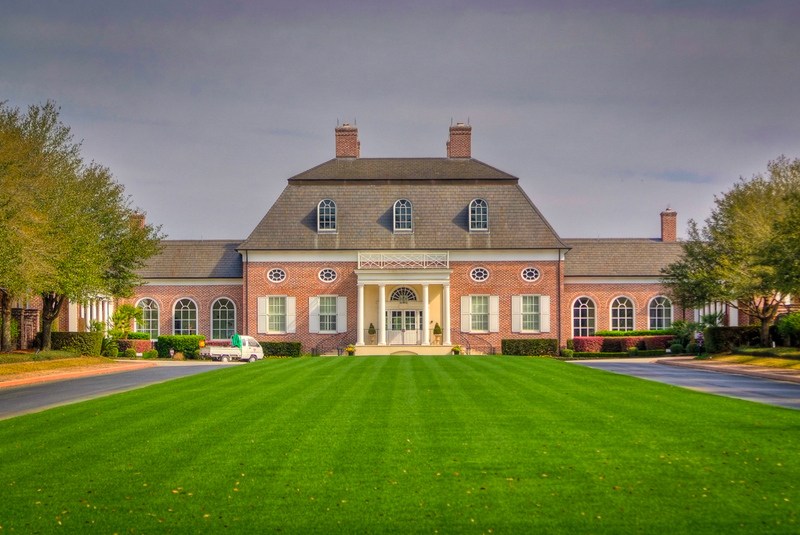 Unique to Berkeley Hall is the core design of its two Tom Fazio golf courses, meaning that fairway view homes’ property lines aren’t directly adjacent to the golf course and none of the community’s roads run through. The North Course challenges golfers with elevation changes, water and testing bunkers. Fazio himself called it his most dramatic design. The South Course is a classic parklands layout with tree-lined fairways set against a backdrop of the pristine Okatie River. A 30-acre Golf Learning Center provides Berkeley Hall golfers with all the tools they need to simulate and practice virtually any shot imaginable on the North and South Courses. With stately Jeffersonian architecture and dignified elevations, the 35,000 square foot Berkeley Hall Clubhouse projects the image of casual elegance that is Berkeley Hall’s signature. Hailed as the “next generation of lifestyle amenities,” the Clubhouse offers members six dining options from the lavish Grand Hall to the more casual Mixed Grille or Veranda, or just a perfect setting for getting together with family, friends and neighbors. Berkeley Hall’s 14,500 square-foot Spa & Fitness Center includes an indoor pool, whirlpool, cardiovascular strength equipment, sauna and steam rooms, spa treatment areas, and a coffee and juice bar. And that’s just the inside. Outside are tennis courts, an outdoor pool with private cabanas, a children’s playground, basketball courts, and a sand volleyball court. Getting out on the water and communing with the natural surroundings are part of what defines the “Lowcountry Lifestyle.” Almost two miles of waterfront on the Okatie River and 10 miles of nature trails winding through the community make Berkeley Hall the perfect place to live it in your own back yard. From the River Park residents cast off on kayaks or Berkeley Hall’s 25-foot pontoon boat into the Okatie River, or fish and crab off the Community Dock. Back on shore, a chain of leisure trails, nature trails, parks and nature exhibits – the Berkeley Hall Greenway – meanders through the property for almost ten miles. Homes for sale in Berkeley Hall include Golf Cottages, Carolina Lifestyle Homes, Lifestyle Cottages and estate homes from about 2,700 square feet to over 6,000 square feet. Home sites are also available (some deep-water lots) to build your dream home from the ground up. Berkeley Hall is located in Bluffton, South Carolina about nine miles from the bridge to Hilton Head Island’s sandy beaches. The main gate is minutes from shopping, dining and services at Berkeley Place and Buckwalter Place, Bluffton Schools and several area churches, and Savannah/Hilton Head International Airport is less than 20 miles away. While golf is the centerpiece amenity, Berkeley Hall is equally suitable to the non-golfing homebuyer looking for casual elegance, first-class amenities, pristine Lowcountry waterfront and active, sociable neighbors in a family-friendly private community.